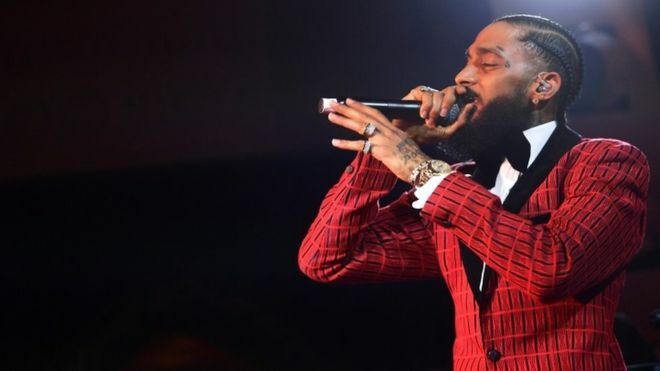 Thousands of fans of Nipsey Hussle are already gathering at the Staples Center in downtown Los Angeles for the funeral of the Grammy-nominated rapper who was shot and killed in South Los Angeles. The funeral, billed as a “celebration of life,” will be held at the Staples Center. More than 20,000 tickets for the event, which were free, were claimed within minutes of being made available online earlier this week. The arena holds 21,000 people and was also the venue for Michael Jackson’s public memorial in 2009. The outpouring reflects the depth of admiration for Hussle, who incorporated his upbringing and experience as a gang member into his music, which spoke powerfully to many who live in Los Angeles’ poorest neighborhood and well beyond. As his musical success propelled him in recent years, Hussle funneled investments and attention to the South Los Angeles streets he had grown up on, earning devotion from fans, neighbors and local leaders.